Roelf Marx: "There is nothing scientific published about the globes, but the facts are: They are found in pyrophyllite, which is mined near the little town of Ottosdal in the Western Transvaal. This pyrophyllite (Al2Si4O10(OH)2) is a quite soft secondary mineral with a count of only 3 on the Mohs' scale and was formed by sedimentation about 2.8 billion years ago. On the other hand the globes, which have a fibrous structure on the inside with a shell around it, are very hard and cannot be scratched, even by steel." "It also seems that the spheres are so delicately balanced that, even with modern technology, they would need to have been made in zero gravity. The story goes that scientists at NASA were totally flawed when they examined them, and were unable to come up with any explanation." However some of the photographs do not seem to support this. 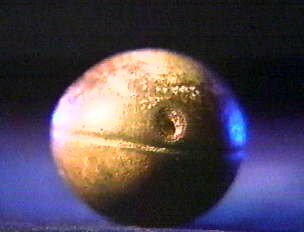 If the Spheres were artificially created and are of extreme ancient origin then what could be their purpose? Could they be examples of an ancient currency? It is known that some ancient cultures used other objects rather than coins and paper as money. A Signal from Outer Space? Could the spheres be a "signal" from outer space? "Pysical Signals" may be more reliable over the vast distances of space than electromagnetic or other energy based signals. 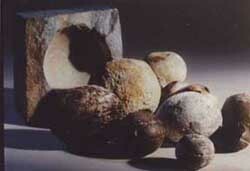 Pehaps they are examples of ancient ammunition, which had either been stored or fired at their present location. Could they have been created for some magickal purpose? Have they been viewed by someone with the ability to see auras or someone skilled in psychometry? Could they be an example of ancient art? Could they be a form of ancient records, information storage devices? Could they be a kind of extraterestrial sureveillance? Perhaps by having particular physical artifacts on a distant planet their surveillance technology can function better. Protective carriers for biological materials? They could have been produced by the billions as part of an extraterrestrial program to �seed� life across the Milky Way.